This eye catching 18k gold plated hoop pendant is made with Cubic Zirconia Crystals. The ring pen.. This Swarovski Element Baby Blue Crystal Heart & Rhodium Plated ring pendant is a definite sh.. This Swarovski Element Baby Pink Crystal Heart & Rhodium Plated ring pendant is a definite sh.. 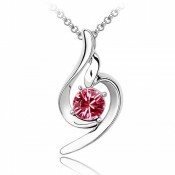 This Swarovski Element Hot Pink Crystal Heart & Rhodium Plated ring pendant is a definite sho.. This Swarovski Element Crystal Heart & Rhodium Plated ring pendant is a definite show stopper.. This Swarovski Element Royal Crystal Heart & Rhodium Plated ring pendant is a definite show s.. This stunning Swarovski Elements double heart pendant is sure to accompany any outfit day or nigh.. This stunning 18K gold plated cube pendant is a perfect accessory for any outfit and will be sure.. This Swarovski Element Lilac Crystal Heart & Rhodium Plated ring pendant is a definite show s.. This pendant is made up of five rose gold plated hoops and four slightly larger hoops which each .. Send your message of love in a bottle with our Pink Heart Crystal MADE WITH SWAROVSKI® ELEMENTS. .. This stunning multi crystal pendant is made with 1 large crystal measuring 5mm in diameter and se..